a gift. I think of them as a valuable treasure, I want to make something special with them. With this on my mind, this design was born, it is a triangular shawl, with lace details and a decorative border to knit enjoying every row. 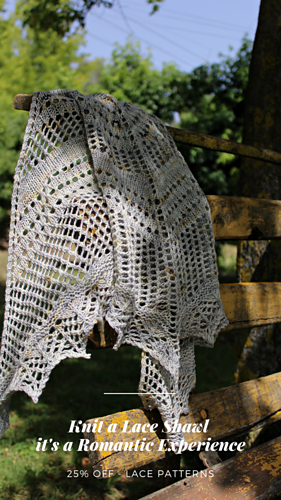 It could be a great project if you are a passionate beginner and want to make your first lace type shawl. I’m happy with the result, I hope it’s also your treasure. Thank you for adding my design to your favorites list !! The pattern contains a chart and written instructions and has been tested. Many Thanks to my testers Isabel, Eva, and Suzana. Thanks in advance for choosing my design, enjoy your knitting!